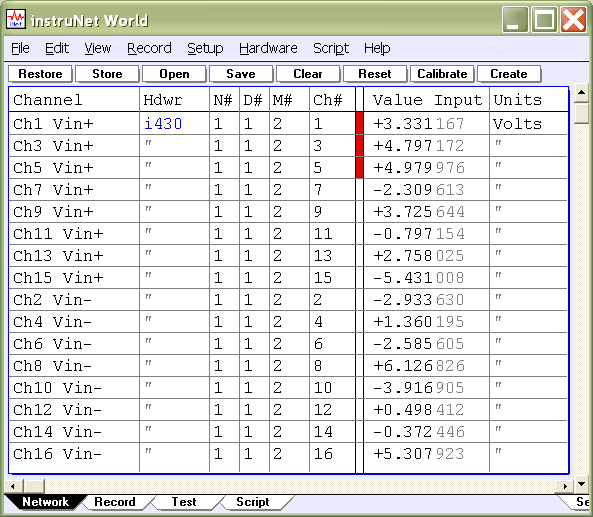 instruNet World Software (not +) is a FREE application program that manages, monitors and operates instruNet data acqusition and control hardware. Additionally, it digitizes long continuous waveforms, spools them to disk, views incoming waveforms in real-time and then allows post acquisition viewing -- much like an oscilloscope or strip chart recorder. Waveforms are recorded in one long continuous stream (strip chart mode); or they are digitized in short segments where each segment begins after a specified trigger event (oscilloscope mode). Any one of the instruNet analog or digital input channels can be used as a trigger. Data is either placed into RAM memory, a file on disk, or is deleted after being plotted. One uses the Setup dialog box to set the sample rate (i.e. points-digitized-per-second-per-channel) and number of points digitized; and uses the Network page to select which channels are digitized. After setting up the system; one can press the Network Save button to save the setup, press the Start button to start digitizing, press the Stop button to stop it, press the Record Save button to save waves in RAM to disk (post-acquisition), and press the Open button to load waves from disk for viewing. A spreadsheet like environment, illustrated below, is used to set and view channel parameters such as sensor type (e.g. thermocouple, strain gage), integration time (i.e. how long the A/D reads a channel to get one value, which is used to reduce noise), analog filter options, and digital filter options (i.e. low pass, high pass, band pass, band stop). Each channel has its own row in the spreadsheet, with the various options in the columns. One clicks on an item to change it. 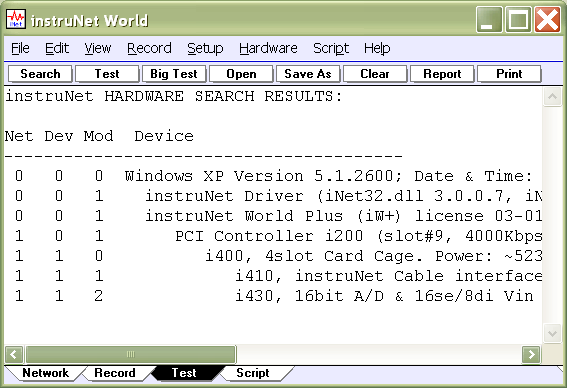 The instruNet World Test page enables one to test and view installed hardware, as illustrated below. 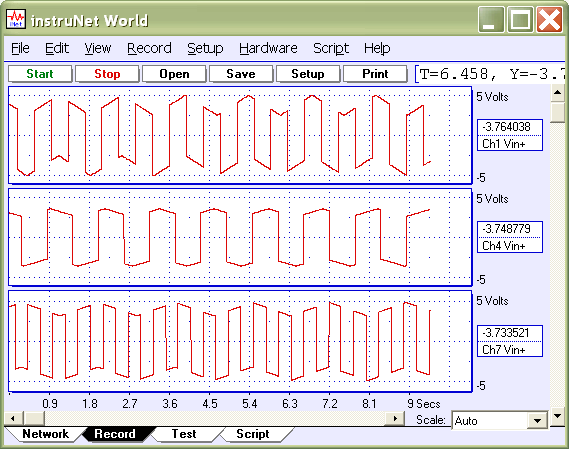 For more information on the FREE instruNet World software, please refer to instruNet World Software. For more information on the NOT free version of instruNet World (called "iW+"), which provides additional features, please iW+.